Cox Providence Marathon Recap - My First Marathon! My husband Scott and I went down to Providence the night before and stayed at the Omni Providence hotel. We could have had a very early start on race day and gone down, the morning of, but my pre-race nerves were enough to deal with, without worrying about making it to the start line on time! And the Omni Providence was the official partner hotel of the marathon. They offered a slightly discounted rate on the room and most importantly, they offered all runners a late check-out time of 2:30. I was able to finish the race, hang out with my family and friends who had come to cheer me on, and the go back to my room and shower and take a nap for an hour before I had to pack up and leave. It was such a great luxury after running! And the hotel is literally steps from the start/finish so it could not have been more convenient. The morning of the race I woke up at 5:45am and had the breakfast I had brought with me from home. I had half an avocado on wheat bread with some salt and pepper, some mixed berries, and a bottle of water. More than my usual breakfast, but not anything that was going to weigh me down as I started running. I then got ready and hung out in my hotel room until 7:10. I mention this only because the race was set to start at 7:30 and normally I would be down at the start much earlier, but the race was small and the hotel was so close, that I was able to stay warm and use a real bathroom and then walked right out and got to the start with plenty of time. It was pretty awesome. I was also really happy to have a cooler and overcast morning. The weather was set to be sunny and warm and I was nervous about handling that after training in the deep freeze of winter. Luckily, it stayed overcast and cool for the first couple of hours of the race. We runners were ready and all lined up for 7:30am sharp. We then waited for another almost 20 minutes for the start. The announcer said the delay was caused by having to clear an accident off the course. However, Scott spoke to a woman who said she had run a few other Eident races and they all started late and each time they claimed they were working to clear an accident. So I guess, just be prepared for a late start if you do this race. The photo on the left is by my mom and the photo on the right, along with the rest of the images of me running on the course, are free downloads from the race photographers. 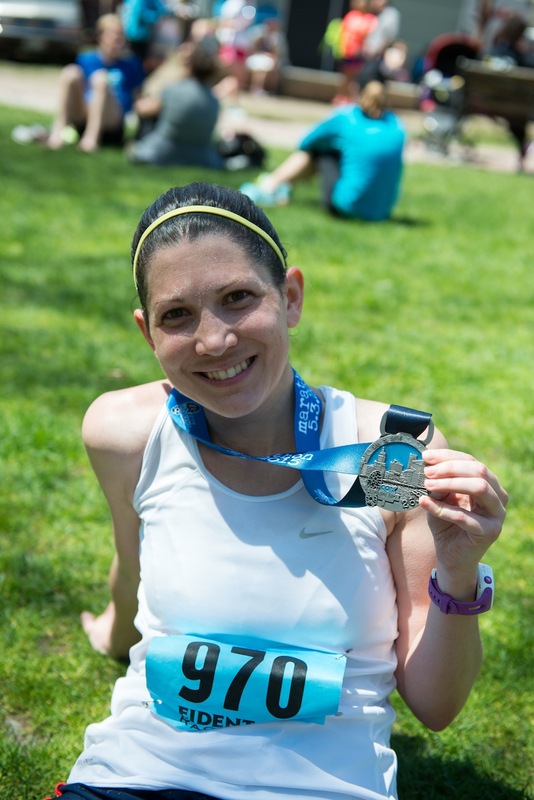 This is a really cool perk of running the Providence Marathon - they send you a link in the days follwoing the race and all images are free! Once we got started, we ran on closed streets through downtown Providence for the first mile or so before leaving the city center. We all went off at once since only about 1200 people were running and it was nice to not have to wait for multiple waves to start. I decided to try and stick with the 4:15 pace group since that was my goal time (that, or just finishing without having to crawl across the finish line). There was a large group all with the same thought and I stuck with them for the first several miles. But it quickly became frustrating to stay with them because after the first mile or two runners were pushed onto the shoulder of open roads. We had to crowd together to avoid the traffic on the roads and cones had been placed along the shoulder to mark the space we had to stay within. It was very tight and I couldn’t settle into an easy stride without worrying about stepping on the person in front of me. So after the hilly portion of the course (the first 6-7 miles) I sprinted ahead of the pace group, found my stride, and stayed ahead of them for the rest of the race. The first several miles were indeed hilly, but the hills really weren’t that bad. They were nothing that I really even noticed or felt were difficult to climb. I trained on very hilly terrain around my neighborhood so in comparison, these hills were a breeze. Although I spoke with some other runners who found them to be more of a challenge than I did, so take my opinion with a grain of salt. There was a decently long climb, for almost a mile, between about mile 5.5-6.5. After that, the course really flattened out and stayed flat for pretty much the rest of the race. The course stayed on roadways until about mile 14 when we entered a bike path. We then stayed on the bike path pretty much all the way through to mile 21. My fab co-workers surprised me at mile 11 and were cheering like crazy - a perfect pick-me-up to keep me going. At the half-way point of the course we were in a quiet neighborhood but a resident was out in their front yard blaring songs from Rocky on repeat. It was pretty awesome and totally put a smile on my face. The water stations on the course were plentiful and strategically placed every 1.5-3 miles. All of them offered both water and Gatorade and many also offered energy gels and bananas. The only time I was wishing for a water station was on the bike path between miles 18-21. For some reason that late stretch in the course was a full three miles without a single water station. At that point the sun was out nice and strong and it was getting hot too, so the choice to not have a water station along that part seemed odd. The toughest part was having to climb a short hill out of the bike path to reach the water station at mile 21 – I was so ready water!! The volunteers along the course were amazing. There were more than enough volunteers at every water station and they were all helpfully yelling out whether they had water or Gatorade and were cheering and smiling all the way. They made the race a great experience in that way, and with Providence being a smaller race with fewer fans cheering in general, the enthusiasm of the volunteers was noticeable and so great! A perk of Providence being a smaller race was that Scott was able to meet me at mile 23 and run with me to mile 26 where he dropped off and let me finish on my own. It was so good to see him at mile 23 armed with a water bottle and more jelly beans, I had just finished the last of the ones I brought with me. He talked to me the whole time he ran with me and kept my mind off how hot and tired I was getting. At mile 26 my mother-in-law was there shouting and holding up an amazing sign she made to cheer me on. Then I turned the corner onto the street for the finish. The finish was a great experience - there was a nice crowd and music was blasting and I could hear my friends yelling in support. 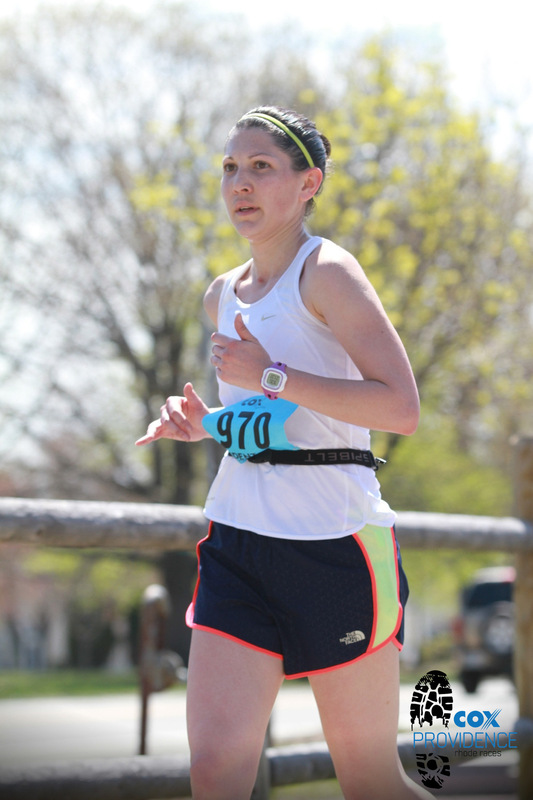 I crossed in 4:10:42 on the official race clock – beating my goal time by almost 5 minutes! I felt good finishing and, final perk of the smaller race, I was immediately able to connect with my friends and family after I got my medal for finishing! Post-race photos by my mom - she is the one in the middle image with me - thanks Mom! One final note I will make is that I kept waiting to “hit the wall” and much to my happy surprise, I never did. I was really nervous about this because I definitely hit that wall during my last few training runs. On my 21 miler, my last long run before tapering, I even stopped in my tracks around mile 19 to cry for a few breaths before sucking it up and finishing my run. The struggle was real. Needless to say I was nervous on race day for those later miles. In training, I did not drink nearly enough water and would only bring a handful of jelly beans in addition to the GU. I simply was not getting the energy I needed to keep up with the calories and energy I was burning and so I hit a wall. So on race day I made a point of drinking water at every single water stop, took two Gu’s in the first ten miles, and ate 26-30 sport jelly beans along the second half of the course. It worked. I was definitely tired and was getting tight in my legs by the end, but no wall. In the first half of the race I kept a 9:25 pace and in the second half I kept a 9:40 pace. I was thrilled to be able to keep my pace as consistent as I did without feeling like I was going to keel over mid-step in the last few miles. 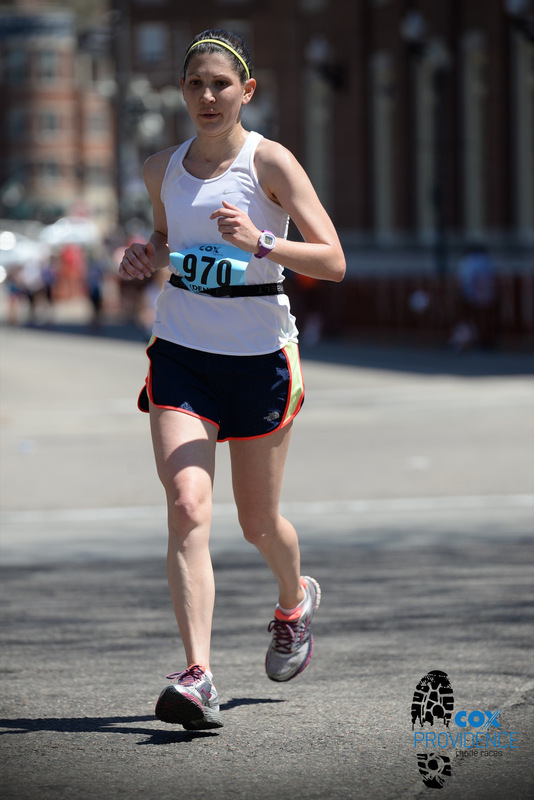 Overall, Providence was a flat and easy course and a great little race for my first marathon experience and I would recommend it to first-time marathoners as long as they bring along a crew of fans to cheer them on – there are a lot of quiet miles on the course because it is so small.